Cheers land lovers! 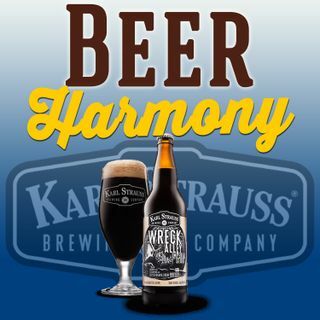 We're off to sea this week as we sip on and review Wreck Alley Imperial Stout from Karl Strauss Brewing Company. Wreck Alley is full of locally sourced coffee, chocolate, and a darkness that has only been seen at the bottom of the ocean. This big imperial stout is 9% of dessert drinking, but will it be a harmonious buried treasure? What is your go-to when it comes to dessert beers? Make sure to follow Beer Harmony on all social media outlets @BeerHarmonyShow and ... See More check out www.beerharmonyshow.com for even more beer! Please send us your beer suggestions and show feedback to beerharmonyshow@gmail.com. You can find out more about Karl Strauss at www.karlstrauss.com. Cheers!